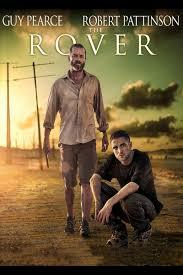 A movie made from the parts of other, better films like the book of Eli and John Wicke, this one is slow and dull. This is a pretty lousy film that moves incredibly slow and has very little to offer. It has all the building blocks for what could have made a decent movie (although all of which have already been seen in other films.) And yet, it doesn’t use a single one of these to its full potential. Instead, the movie gives us hints at each one to show us what the film might have been if we only got more of these things. So there’s a cool car standoff scene in the beginning filled with lively characters. Those characters go and disappear right after that, for nearly the rest of the film. There are some moments of great dialogue scenes, but they are over quickly and then the vast emptiness of silence fills the space and takes over. This movie has so little to offer us and moves so slowly that it’s kind of a mess. 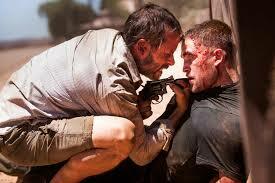 The Rover is a pretty poor movie. It’s supposed to be an appocalyptic western like The Road Warrior, only there is very little action. On top of that, the world seems to not have very many new rules or establishments. Other than a shop where guys have shelves filled with all kind of items and hold you at gunpoint to buy something, this world doesn’t feel all that unique. The story here is about a guy who has his car stolen and now spends the rest of the movie chasing after the guys who stole it, tryin to get it back. If this was one long chase movie, it could have been cool. At least then, there would have been plenty of action. But it’s not. Instead, this is more of a road trip movie that moves at a snail’s pace with no clear direction or focus. Our main character is Eric (Guy Pearce), and he is the one out to catch the guys who stole his car and get it back. The way he pursues it so heavily, to the point where even when he has another car, he won’t stop until he gets his back, makes this feel like a sort of vengeance film. It’s as if these guys attacked him and left him for dead, and then stole his car. Only they didn’t. They simply stole it and moved on. If the motivation were a little stronger, this might actually feel a bit like John Wicke, with a man seeking vengeance at all costs. Only here, the mssion is clear, but the motivation is not. Now, to be fair, there is motivation, and the movie holds it as a mystery until the end. Even still, considering that the whole movie hinges on understanding why this character is doing this, and who exactly the character is, maybe holding it until the end wasn’t the best move. Especially since the movie has so little else to offer. This is a film that spends more time being silent and having the characters move around without speaking, then it does with dialogue. Eric is a very quiet character and the movie doesn’t do much to surround him with conversation either. The very first shot of the film is simply of Eric sitting there, in his car, for a long while, barely moving. When he gets out, he goes until a building to get water. That’s when a trio of crazy characters pull up, one of them shot, and the rest of them out of their minds. They see Eric’s car, hotwire it, and take off. Now these characters are interesting. At the very least, they have personality. If they are to be prominently featured in the movie, then this film has potential. Unfortunately, they are not. Eric sees the guys take his car and he sprints out of the building. He jumps into their car, that they left behind, and goes after them. We end up with a stand off with both cars stopping in the road and the passengers getting out. This standoff scene is the best scene in a movie. It’s a real shame that it comes so early on. This is the kind of scene that reminds me of the movie Locke or of the Steven Speilberg films Duel. Just chracters in cars on the open and barren wasteland of a road. No sooner does that scene end, with the three guys knocking Eric out and leaving him there, then does the movie plunge downhill fast. When Eric wakes up he gets back in the car they left, and drives off. He stops at a station and asks the people living there if the three men came by. He meets an older woman who is willing to prostitute the boy she lives with (probably her son), and a two Asian men who are playing cards with a midget. Eric asks the midget to sell him a gun and when the midget takes Eric out to his trailer and shows him the piece, Eric shoots him in the head. And this is our hero. At that point, I pretty much gave up on liking this character. Eric keeps driving on and he comes across a young man who is in very bad shape. This is Rey (Robert Pattinson), and he claims to be the brother of the owner of the truck Eric is driving. Rey has been shot and he needs help. Eric needs help with finding the guys who stole his car and has no idea where they might have went. He kidnaps Rey and takes him along to help him find his car. If this now turned into a kidnapping movie, it might have been cool. It doesn’t. The two men end up being more friends then kidnapper and victim. On top of that, Rey seems to be either mentally handicapped or just have a very heavy accent that is hard to decipher. The conversation between the two of them isn’t much and certainly isn’t interesting. From here, the movie slips into an area that is incredibly slow and boring. Nothing really happens for a while. Eventually the two of them end up at a motel where Rey is left the room alone and thinks there are people coming after him. He is right, only he strikes too soon, without seeing his enemy. When someone comes to the door, Rey shoots it. As it happens, there was a little girl who came to the door, and Rey has now shot her dead. And no sooner does he do this, then the real enemy opens fire on him, shooting through the motel room windows. Eric comes up and saves Rey from the man opening fire, and then Eric gets kidnapped by the military. He is brought to an army base and sits down for an interview with the arresting officer. Eric opens up at this point (finally) about his wife and how he caught her with another man. He shot them both, and nobody ever came to arrest him or pursue the case. He tells the officer that this was the part that hurt most of all. That nobody cared. Conversations like this are interesting, and could have made the movie worthwhile if there were more of them. Instead, like the car standoff in the beginning, it is a one shot deal and just a chance for them to show us what the movie might have been if they put more effort into it. There’s only one other decent conversation in the film, and it’s more of a quick line than a conversation. When Rey tells Eric that he can’t get the image of the dead little girl out of his head, Eric tells him that’s the way it should be. He says that not being able to stop thinking about someone you killed is the price for killing that person.. This movie is a long and tiring journey that occasionally has moments which show how much better it could have been. The start of the film, with the car getting stolen, was great. But then we never heard from that trio of intereting characters who stole it again, until the very end of the film. The dialogue had moments of being strong, but most of the time, it wasn’t even attempted at all. This movie wants to be about landscape and style more than about story. It accomplishes it goal, but that does not make for a good film. It needed to have more going on, including a sharper focus and direction.